Business stationery design is important, particularly when it comes to business cards. Think of your business cards as the one employee who never sleeps. Each time you hand out a business card to a contact or send a letter to a client, the impression that you leave should be a professional one. When you choose to have your business stationery design performed by Webati, you will be able to rest assured that we will create a corporate identity and brand ambassador that you can be proud of. Our professional designers have many years of experience in their field, and we will work closely with you to create a professional design that is truly representative of your business. “You have an important meeting with a business client. The meeting seems to go well, and the potential client agrees to contact you if they decide to use your services. At the end of the meeting, you provide this client with a business card. Let’s say that a week later, this potential client has a meeting with one of your biggest competitors. Their meeting is goes just about the same as yours did, and the two agree to be in touch in the future. In this particular scenario, the business who projects a more professional image through their business stationery design is going to seal the deal. Potential clients are going to notice the effort you have put into the small details of your company’s image. When they know that you care about how you are represented, they are going to be more likely to entrust their business to you. If your business cards or letterhead look cheap or generic, it is going to reflect poorly on your company. 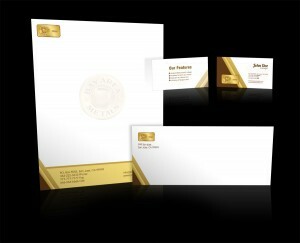 Let Webati help you create the right first and lasting impression through our professional business stationery design. Contact us for a free consultation today! You have nothing to lose, but your business has everything to gain. We guarantee it will be one of the smartest business investments you will ever make on behalf of your company.